I know that there is no way to compare or find how Martians and Earthlings are like and unlike each other, at least not now. I mean, how could you compare or measure a Martian with an Earthling when we’ve never even seen an Earthling? Comparing or weighing an Earthling against a Martian would not be possible at this point because we Martians aren’t even sure that there is life on Earth, much less intelligent life! So for now we can only compare Martians with two blue noses and Martians with four red noses, finding out how they are the same and not the same as each other. Quiz: Try again! What are you doing when you compare two things? You are taking a look at each and figuring out how they are the same and different from each other. You completely ignore one thing but favor the other, and so only pay attention to the one you like. You are measuring the weight of each to make sure that they both weigh exactly the same. When you compare two things, you are finding out how they are similar and how they are different. Kumquats and Pears So I decided to compare kumquats with pears, and found them to have mostly differences between the two! When you compare two things, you find out how they are “equal” or similar “together”; by virtue of that process, you find out how they are not “equal” or not the same as well. 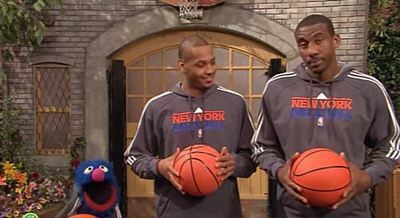 Sesame Street How Grover compares to these NBA players.